Marlene Farrell and her children Quentin and Alice run along a trail hear Leavenworth. 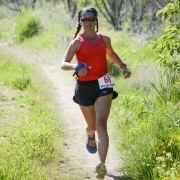 In the spring, five trail races dictated my training. So this summer I took a hiatus from races after June. Other things were more important: my kids’ swim team, time to write, house projects, and vacations. Now a race date looms ever closer on the calendar. On Oct. 18 I will race in the National Championship Trail Half Marathon at Lake Padden in Bellingham. I need to rack up the miles and put in tough intervals to prove I deserve my spot on the starting line with 10 nationally ranked women (I am not ranked at all). I gulp as I look at my self-prescribed training schedule leading up to the championship race: 70-mile-plus weeks, long runs, intervals, time trials up Icicle Ridge. There will be many mornings when I run in the dark, just me and my swirling thoughts. Sometimes I’ll wish I were still tucked beneath cozy blankets. But I’ll get up because the previous day I will have just run with friends, and my running resolve will be fortified against doubts and excuses. Yes, I know one of the keys to my racing success doesn’t depend on heart rate, BMI, or core strength. Those things may be important too. But after so many races over so many years, what sustains me is my friends. After returning from vacation, I have made a point of running with friends again. I’ve realized just how much I have missed the companionship forged by covering miles, side by side. Close to home, I am excited that my family has gravitated to running. My husband Kevin and I run together now and then while our children Quentin and Alice dress and brush their teeth. It reminds me of all the runs before we had kids. Now we can welcome the day together as the sky blushes behind the curves of Sleeping Lady. 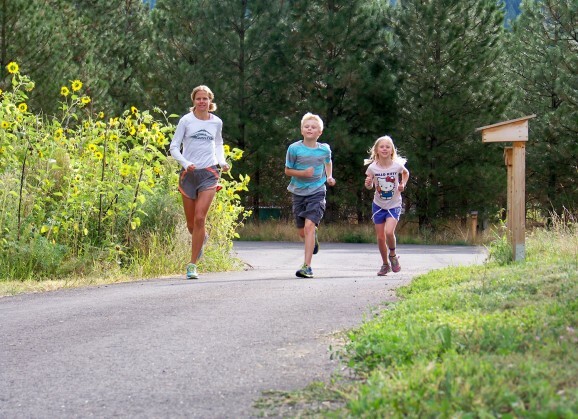 We’re trying to establish a running habit with our children. When I return from my own run, I hand my GPS watch to Alice. Then the four of us take off to run a mile together or in two pairs. With each day Quentin’s and Alice’s paces become more regular and smooth. At the end, up our neighborhood hill and driveway, they breathe hard, and their cheeks glow pink. Just like me, they are ready for a hearty breakfast. Recently, my friends Stephanie, Teresa, and Kelly, whom I haven’t seen all summer, eagerly agreed to rendezvous for an early morning birthday run for Carrie, my most regular running partner. We surprised Carrie with muffins, coffee, berries, and cards at a random parking lot along our route. How fun it was to catch up on everyone’s summer trips, races and school preparations. I also ran with Erin, my 15-year-old friend. 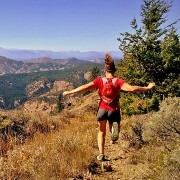 I finally got to hear her impressions of the White Pass Running Camp and talk about the upcoming cross-country season. Somehow, though I am more than twice her age, we talk easily, sharing a mutual love of running for its own sake. Her potential is inspiring, and I am proud to share a bit in her development into an indomitable athlete. My friend Laura met me at a dusky hour, and we dragged each other through the 20 rugged miles of the Enchantments. We made decent time but our lack of long run preparation affected us. We had much to talk about, and stunning views, so it was just the last 5 miles that required a Zen focus as I followed Laura down, down, down. In the next month-and-a-half, my social runs will be as crucial to my race prep as a good night’s sleep and a diet rich in antioxidants. 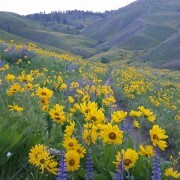 The latter help heal and strengthen my aching muscles while my runs with family and friends rejuvenate my passion. On race day when I’m testing my limits, I will think of each and every one of those runners who helped me get there. 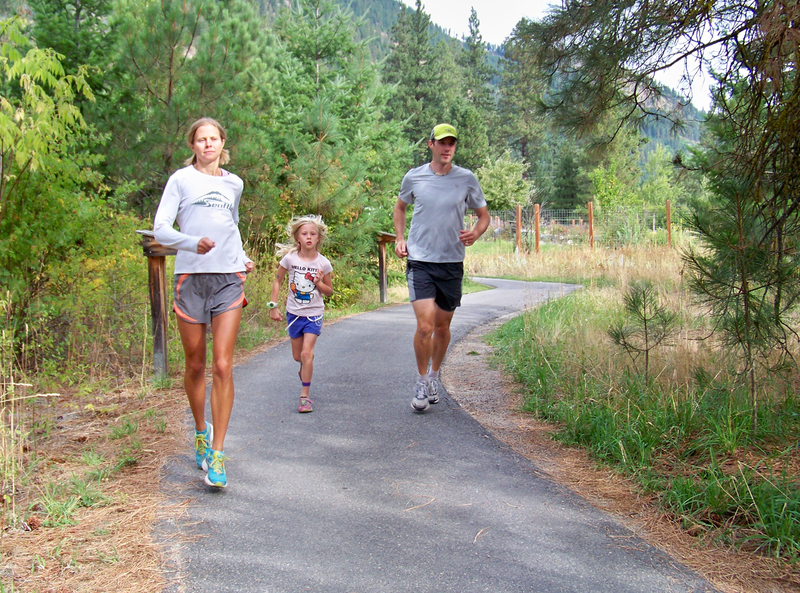 Marlene Farrell, daughter Alice and husband Kevin run together near Leavenworth.